The bulk of our itineraries are semi-independent trips. Our clients are not escorted on the train but are assisted at each stopover point by our local suppliers. 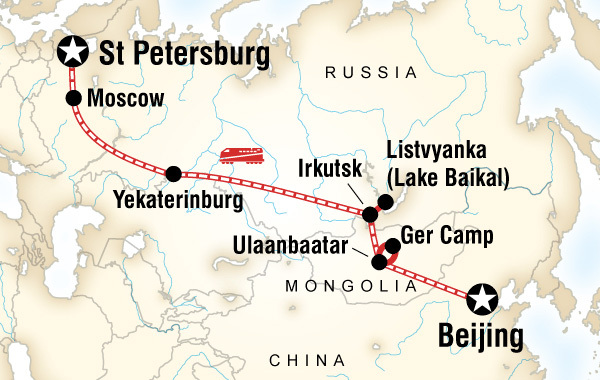 Travel is on the normal services of Russian, Mongolian and Chinese trains and our clients are not booked as ‘groups’. However some travellers prefer the security and camaraderie of a group trip. There are nowadays a large number of big name companies that offer such trips including Intrepid Travel, Sundowners, Gadventures, Travel Indochina, Peregrine Adventures, Explore and so on. Each company offer slightly different itineraries and appeal to people of different ages and interests. We can help you choose the right tour for you and of course we will assist with all the necessary visas. Please contact us at 1300 654 861 or by e-mail to discuss your options. Below are two popular group itineraries. Visit the Great Wall at Mutianyu and soak in the history and scenery. Enjoy a guided tour of the Forbidden City and Tiananmen Square. Opt to see an acrobatics or kung fu show, visit the Temple of Heaven or Lama Temple, or enjoy a bicycle tour around the city. Enjoy an included city tour with a local guide to learn more about the rich history and culture of Mongolia. Later, leave the metropolis and travel into Mongolia’s Terelj National Park. Enjoy a night in a traditional ger camp. 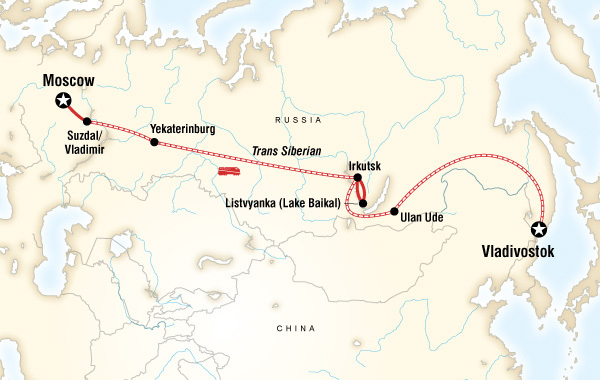 Spend a full day on the train heading deeper into Russia and watching the landscape change. Travel to Listvyanka on the shores of Lake Baikal. Opt to visit Baikal Limnological Museum, enjoy a ‘banya’ (Russian sauna) or take a boat ride on the lake. Learn more about local life with a homestay. Continue on from Irkutsk to Yekaterinburg. Drink with locals in the dining car, buy homemade food on the platform from “babushkas” (Russian grandmothers), read, relax, play cards, meet your fellow passengers, watch the taiga forests go by — this is what the experience is all about! Arrive to Moscow and start exploring. Take an orientation walk of the metro then opt for a Moskva River boat trip or a visit to Lenin’s Mausoleum, the Tretiakov Gallery or St Basil’s Cathedral. Spend another day in Moscow before an overnight train to St Petersburg. Arrive in the morning and enjoy a walking tour of the back streets and hidden alleys of St Petersburg. Arrive at any time. Want to experience St Petersburg? Contact Us to book your St. Petersburg Add On. Enjoy a guided tour of the Kremlin and Armoury. Spend a free afternoon visiting St Basil’s Cathedral, Red Square, or exploring the fascinating Moscow metro. Arrive in the morning to Irkutsk and drive to a small town on Lake Baikal, Listvyanka. Enjoy a homestay on the lake and opt to tour the Baikal Limnological Museum or enjoy some relaxing in a banya (Russian sauna).